This LED lamp, which Spanish designer Victor Castanera will launch at the upcoming Maison&Objet fair, features glowing glass orbs that balance between steel shelves. The Balance lamp was designed by Castanera for young Swedish brand Oblure. It is made up of a number of spherical components, sized to achieve a "perfect balance". The lamp's base is made from black marble to help steady the structure, while delicate hand-blown glass orbs sit around the light bulbs, slotted between the angular steel shelves. Black metal spheres have also been added, to create right amount of density to act as a counterweight to the glass orbs. All wires and connectors are hidden inside the construction. To change each LED bulb, the user just lifts up the glass sphere to swap it out. "From the beginning, Balance was a true challenge," said Castanera. "We had to work with custom-made LED boards to be able to evenly illuminate the orb and at the same time connect the second orb at the top of the lamp." "I want Balance to be a reminder of how extraordinary many everyday experiences are. With Balance I want to evoke the beholder's curiosity of the world around them." 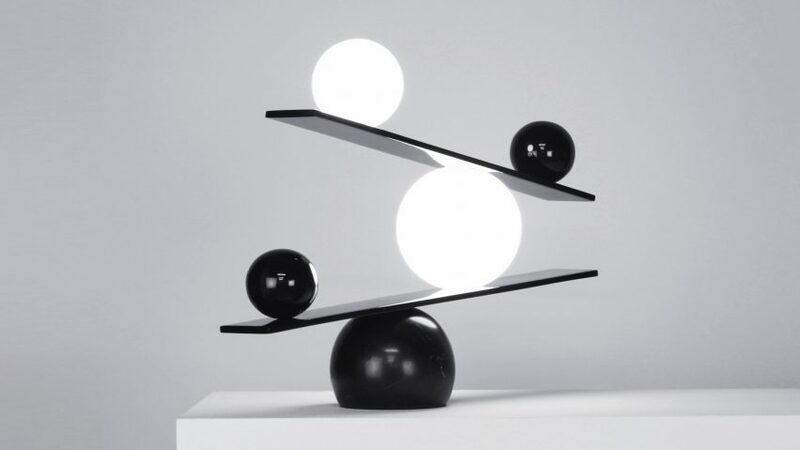 The Balance lamp is the second product to be released by Oblure, which was founded in 2016. It will launch at the Maison&Objet trade fair in Paris later this month, where the event's designer of the year Pierre Charpin will also be showcasing his work in a self-designed hub.